One summer, my neighbors were a family of pigeons who made their home on wooden planks below the bathroom window of my Manhattan studio apartment. The mom and dad moved in shortly after my husband moved out. They were a raucous pair, like some of my other neighbors, talking loudly and keeping odd hours. New Yorkers tend to have a love-hate relationship with pigeons. Some New Yorkers feed them from park benches, and some raise them on their rooftops. Some steal them and sell them on the black market. Many disparage them as "rats with wings,"even though they're generally clean and disease-free, and kin to the mourning dove and the now-extinct dodo. Scientists, journalists and artists have explored their behavior, bravery and beauty in an effort to repair their damaged reputation. Most New Yorkers, though,just tolerate them. Like George Costanza said in the Seinfeld episode in which he ran over a group of pigeons, "We had a deal!" We stay out of each other's way. I met one New Yorker who was terrified of them. We were dining at an outdoor restaurant when a pigeon swooped past us. She jumped from her chair, screaming and flailing her arms, nearly knocking over our table. When she finally calmed down, we requested that our party be move dindoors. "How do you live in New York if you have such a fear of pigeons?" I asked. It wasn't until I started seeing a shrink that I began to pay closer attention to pigeons. My decade-long marriage to my college sweetheart had imploded in humiliating fashion when he ran off with his leading lady from an acting class a year after we moved to the city. My therapist encouraged me to "sit with my grief," which I found easiest to do while taking long showers. I was doing such one morning when a pigeon landed on the ledge of my open bathroom window. I stopped lathering; the pigeon cocked its head toward me, and our eyes locked. "Hey Dudley," I instinctively said. He blinked, seemingly in acknowledgement. Like a homing pigeon used during the world wars, I felt like he was carrying a message for me. I carefully turned off the shower and slowly stepped out of the tub. Naked and wet, I ran for my camera. 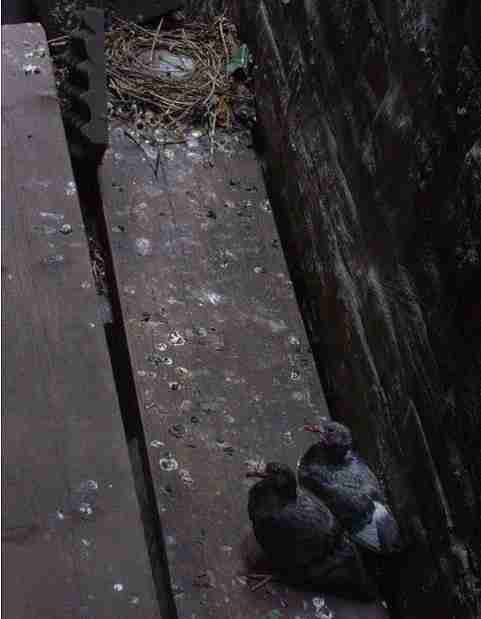 I noticed another pigeon on the planks below, and soon realized they were together. For the next several weeks, I watched, photographed and sketched the Dudleys, often with my two cats, Perseus and Calliope, excitedly alongside me. It's estimated that over a million pigeons live in New York, yet virtually no one has seen newborn squabs. 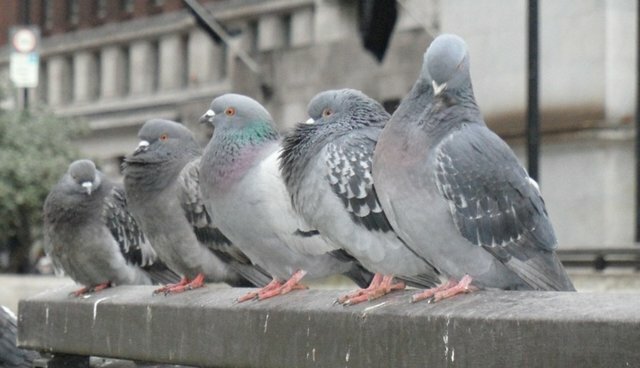 That's because adult pigeons often nest in protected areas like high ledges and hidden spaces between buildings. The babies quickly mature and leave the nest only when they're able to fly, at which point they appear indiscernible from their parents (although the young ones' eyes are blacker and their down fluffier). I realized this was a rare glimpse into the life cycle of pigeons, and the timing couldn't have been better. Knowing that pigeons often mate for life, or at least for many seasons in a row, I wanted to see how they went about building their family life as my own was falling apart. The Dudleys became my therapy birds, comforting me through some of my darkest moments. Ilaughed when Mom and Dad Dudley quickly and noisily copulated on my window ledge (at least that's what I think it was). It was an awkward maneuver given the narrow shelf, not unlike the first time my husband and I slept together in his dorm room bunk bed. Their cooing afterwards punctuated the quiet darkness,as I lay in bed alone. I cried as they built their nest together: Dad Dudley collecting twigs, Mom Dudley placing them just so, each patiently respecting the other's task at hand, until they had woven just the right foundation for their home. Unlike their sense of boundary and purpose in a confined space, my marriage suffocated in the diminutive square footage of our apartment, which relatively speaking is not much bigger than the Dudleys' nest. I awoke to the incessant cries of twos quabs at five o'clock one morning, signaling their arrival. Although their squeals sounded desperate and anxious, I took them as a good sign that the chicks were healthy, like the relief parents feel at the first cry of their newborn. My husband felt our lack of having children, particularly my ambivalence about it, contributed to the failure of our marriage. I wondered if or whenI'd have a new family. 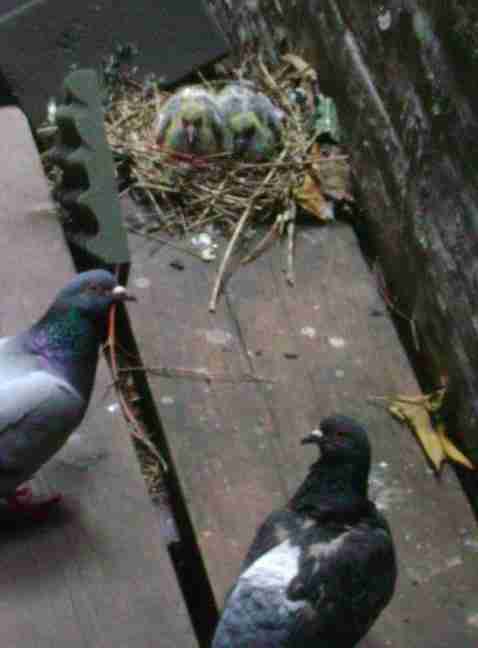 I yelled at a trespassing pigeon one evening as he picked on the babies, who'd been left alone. The Interloper had them cornered; they squealed for their lives. Enraged, I opened my bathroom screen and dropped a small piece of broken plaster to shoo it away. If only I could rid the other woman from my family just as easily. I clapped with delight when the squabs finally took flight after weeks of practice, knowing that I, too, eventually would create a new life in the daunting, yet magical possibility that is NewYork.